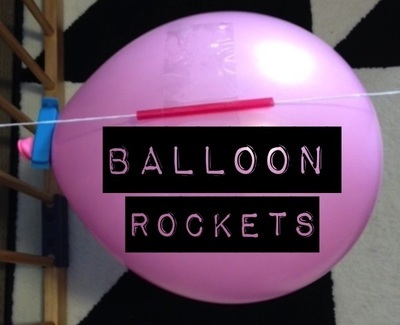 You will have the kids squealing with delight when you set up a balloon rocket! Best of all, you will probably find everything you need lying around the house. My kids love this activity and are always asking to do it whenever they happen to see me using string. Find an area where you can tie a couple of meters of string across a room in a straight line. Clear the area of hazards - little kids get very hyped up by this activity and run after the balloon. Cut off a few inches of the straw and feed the string through it. Tie the string up across the room. The straw should be strung up between the two anchor points. The string should be taught. The string is set up ready for the balloon to be attached. Cut off approximately 25 cms of tape and have it ready to use. Blow up the balloon (with the pump if you are using one) and clip it temporarily. The balloon has been blown up with a bike pump and clipped. Hold the balloon under the straw with the clip facing one of the anchor points. Attach the balloon to the straw with the tape as shown in the picture below. Balloon rocket attached to the straw with tape. Hold the balloon with your fingers so air wont escape. Remove the clip. 5-4-3-2-1 .. release your fingers!!!! Remove tape from the balloon and straw for reuse. Repeat the last 6 steps ad nauseam! Both the tape and the balloon will last for several turns, but not forever, so be ready to replace both when needed.